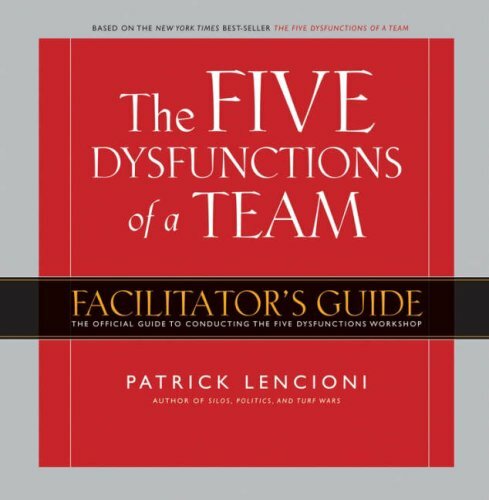 Based the leadership fable, by Patrick Lencioni, the Five Dysfunctions of a Team Workshop Deluxe Facilitator's Guide Package provides everything needed for high-impact workshops for intact teams. There is a Facilitator's Guide which has an introduction to the model, instructions for administering and debriefing the 38-item team assessment, and a script for presentation delivery. In addition, the package also contains a copy of the Five Dysfunctions of a Team book and the Five Dysfunctions of a Team Video Presentation (DVD), which comes with its own 27-page supplemental guide. Deluxe Facilitator's Guide contents: binder (with tabs and loose-leaf pages), hardcover book, paper assessment, sample participant workbook, poster, CD-ROM, and DVD.